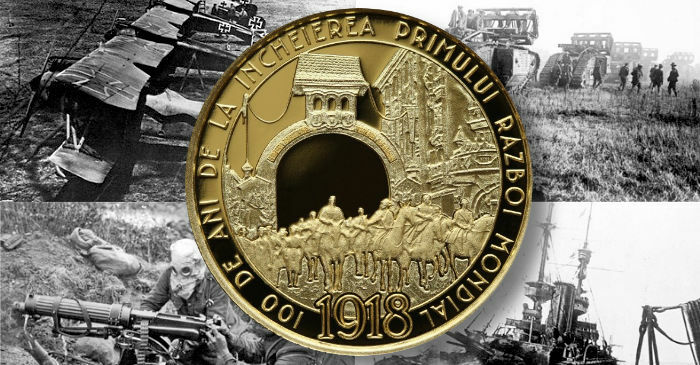 The National Bank of Romania has issued (29th May) new gold coins which mark the centenary anniversary of both the end of the First World War and the territorial additions to the country gained as part of the peace treaty which officially ended the hostilities. Romania’s territorial gains during the negotiations, which ratified the Treaty of Versailles, were quite substantial, having taken control of a great portion of Transylvania away from the former Austro-Hungarian Empire and what had previously been under the authority of Hungary. Despite the fact that Romanian military defeats were numerous, the government had entered the fighting allied to Great Britain, France, and Russia — but since Russia’s own revolution meant they would withdraw from the front and the fighting altogether — Romania was now surrounded by hostile countries allied to the central powers of Imperial Germany and Austria-Hungary. The government in Bucharest concluded peace agreements with their neighbours — including the ceding of territory to Bulgaria. At the peace conference in Versailles, the Romanian delegation, which included Romania’s formidable Queen Marie, demanded substantial territorial gains for her country, citing that as Russia is now headed by the Bolsheviks, it would be wise to have as much of the former Austrian-Hungarian territory under the authority of Romania to impede the spread of communism. Romania not only recovered the land lost to Bulgaria, but more than doubled their pre-war overall territory. Prior to the outbreak of the Great War, the kingdom of Romania extended to 138,000 square kilometres (53,282 square miles). After the fighting ended, Romania’s land area more than doubled to 295,049 square kilometres (113, 919 square miles) with an increase in population from just 7.5 million people in 1915 to 15.5 million by 1920. These borders, which were ratified by the Treaty of Versailles, were, for the most part, kept intact until the outbreak of the Second World War. As a result, Romania gained additional territory, but also lost much of the territory of Moldavia (present-day Moldova) to the USSR as it gained control of this land and incorporated it into the Soviet Union. The gold coins are produced by the Monetăria Statului, at their facilities in Bucharest, on behalf of the National Bank of Romania. 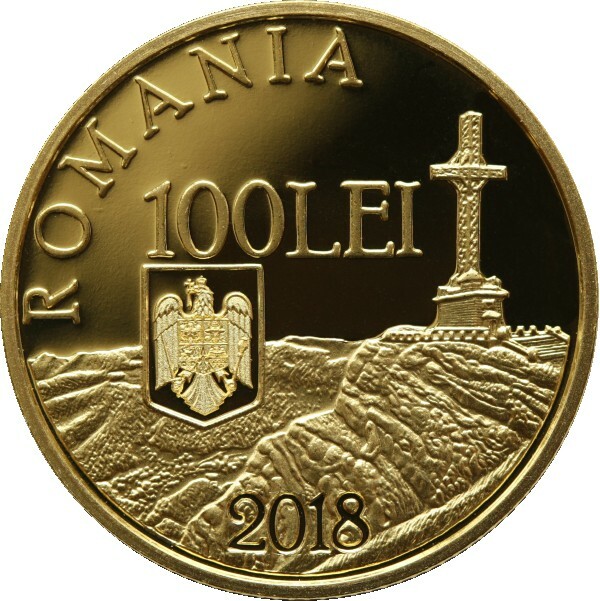 The obverse of the coin presents the commemorative cross of the Romanian heroes from the First World War from Caraiman Peak. The text ROMANIA is placed in the shape of a circular arc above the primary design along with the denomination 100 LEI, the coat of arms of Romania, and the issue year, 2018. 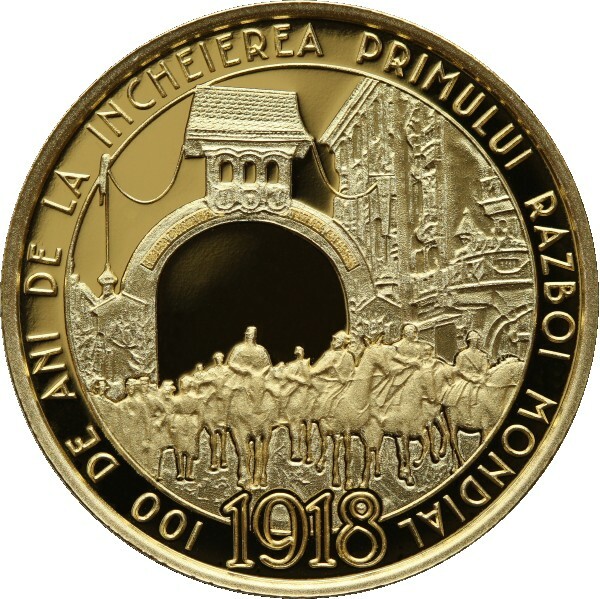 The reverse of the coin depicts the historic scene of King Ferdinand I and Queen Marie’s entry into Bucharest on the day of the declaration of the cessation of hostilities in 1918. The inscription 100 DE ANI DE LA INCHEIEREA PRIMULUI RAZBOI MONDIAL (100 years of the end of the First World War) is included with the year 1918. The gold coins are individually housed in transparent plastic capsules and are accompanied by leaflets featuring a presentation of the numismatic issue in Romanian, English, and French. Each leaflet comes with a certificate of authenticity bearing the signatures of the governor and chief cashier of the National Bank of Romania. The coin is available directly through the Bucharest, Cluj, Iasi, and Timişoara regional branches of the National Bank of Romania.